Molybdenum disulfide (MoS2) is a transition metal chalcogenide material widely used in photocatalysis, synthesis catalyst, hydrodesulfurization, hydrodeoxygenation, electronic, optical, mechanical, even in hydrogen evolution reaction (HER). The morphology-controlled preparation of MoS2 is currently highly topical. Many preparation routes have been developed for synthesis of nanometer MoS2 over the last decades, and MoS2 nano-materials with different morphologies, particle sizes, and porous features can be obtained from different raw materials through different pathways. However, the morphology and crystal size of MoS2 was uncontrolled and the properties of the obtained material were variable. The template method is an efficient means of synthesizing high specific surface area MoS2, and includes the soft template method and hard template method. Soft templates mainly include polymers and surfactants, MoS2 prepared through this method has no mesopores, a low surface area, and it is difficult to remove the template. Using hard templates to prepare MoS2 species have a wide pore size distribution. 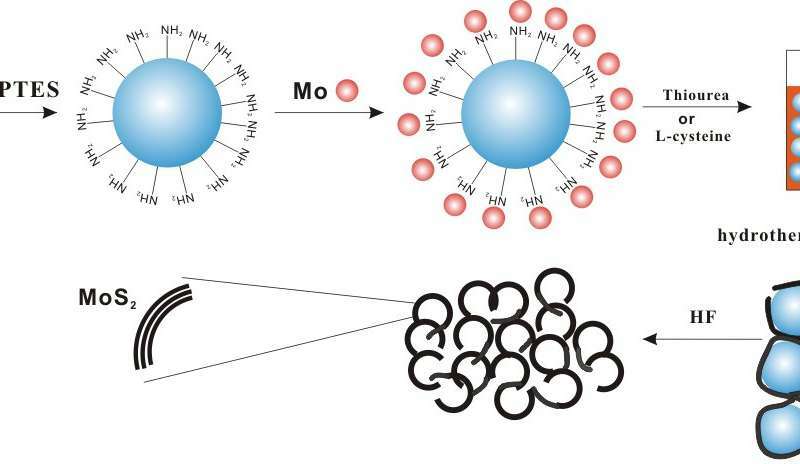 Based on the aforementioned considerations, Amino groups can coordinate well with molybdenum to assemble a long-range super-molecular system; it can prepare MoS2 nanoparticles with a high specific surface area, having a controllable pore size and continuous porous morphology. Researchers prepared porous MoS2 with different morphologies and a high specific surface area through the use of an aminopropyltriethoxysilane (APTES)-modified SiO2 hard template and different sulfur sources, i.e., thiourea or L-cysteine, which lead to form two different morphology. Declining fossil fuel resources and the increased demand for petroleum continue to drive researchers to find new energy sources. Bio-oil is an ideal liquid fuel, but requires consecutive processes. Hydrodeoxygenation (HDO) is the most common route for upgrading bio-oil, and MoS2 catalysts produced using methods detailed in this research have shown excellent performance in the HDO reaction.